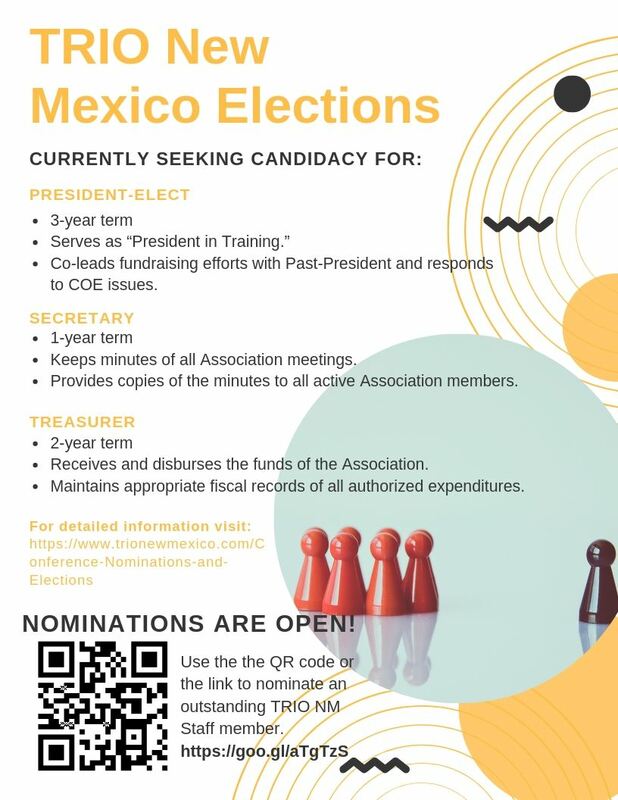 TRIO New Mexico will be accepting nominations during the 2019 Spring Conference for the officers of the 2019-2020 TRIO New Mexico Executive Board. Criteria and descriptions for each position are listed below. The President-Elect serves with the same powers as the President in the event that the President becomes incapacitated or resigns. The President-Elect serves as “President in Training.” The priorities of this office include co-leading fundraising efforts with Past-President and responding to COE issues. The President-Elect is a 3-year term/commitment. The President Elect will serve in the position of President Elect (year 1), President (year 2) and Past President (year 3). Should have been an active member in the TRIO New Mexico Association for at least one year. Must have secured a verbal authorization or a letter of support from his/her program director and from institutional administration within 24 hours of being elected to the board. Click on the image to access the nomination form. The Secretary shall keep minutes of all Association meetings and provide copies of the minutes to all active Association members. Attend SWASAP Board Orientation and additional board meetings, serving as state liaison. At the end of each term, the Secretary shall provide the new Secretary with prior records. The Treasurer shall be responsible for receiving and disbursing the funds of the Association, maintaining appropriate fiscal records, and providing a Treasurer’s report at all Association meetings. The Treasurer and President shall sign checks for all Board authorized expenditures. Attend SWASAP Board Orientation and additional board meetings, serving as state liaison. At the end of each term, the Treasurer shall provide the new Treasurer with prior records.